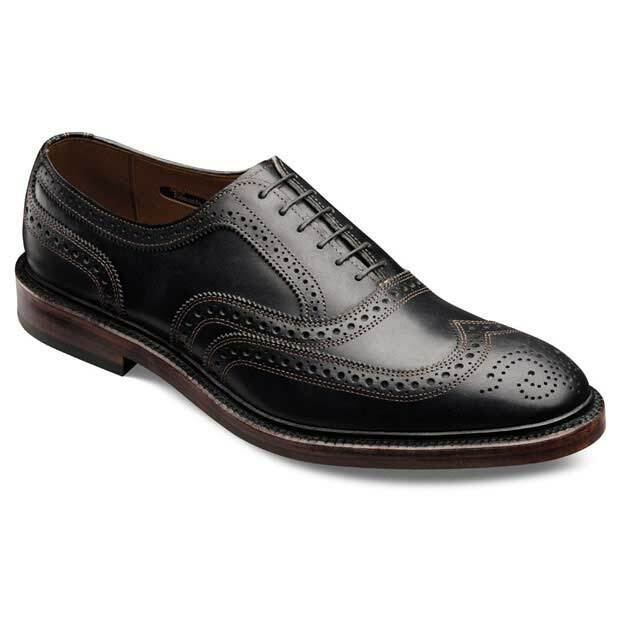 For my birthday, I just got the Allan Edmonds McTavish oxford wing tip pair of shoes in black with reddish accents. I have gone without new dress shoes in a few years, owing to the scarcity of American-made dress shoes. Allan Edmonds is the only large-scale maker of shoes that still manufactures their shoes in the US, that I am aware of (please comment if you know of others). I had been saving up for this pair and my wife got them for me for my birthday on Zappos.com. I am thrilled with the shoes. They are not cheap ($295 on Zappos) but they are within the typical price range for quality Italian dress shoes. There are certainly more expensive ones. I really like the feel and thickness of the leather and the reddish accents. These are very handsome shoes that go with either casual or business dress. These are the sort of shoes you’ll keep for probably decades, as they can be refurbished by the manufacturer if you send them to Allan Edmonds. I read about the shoes on AllanEdmonds.com. They are made in Port Washington, Wisconsin, and it seems that they get at least some of their leather domestically from a factory in Chicago. Below is a pic of my new shoes!